The Durban Automotive Cluster (DAC) is a well established, proactive and ambitious public-private partnership between the eThekwini Municipality and the automotive industry in KwaZulu-Natal that is focused on developing the competitiveness of this industry. The partnership, established in 2002, enjoys the support of the major role players and stakeholders in the regional automotive industry. The DAC is an industry driven initiative, drawing on the leadership and expertise of individuals from a broad range of automotive member firms and using it to identify and address a wide variety of challenges confronting the automotive industry. KwaZulu-Natal is home to a significant portion of the automotive industry in South Africa. Toyota South Africa, the largest vehicle manufacturer in the country, is located in the province, as are several major national suppliers. The region's total automotive employment is approximately 30 000. Over 25% of all light vehicles manufactured in South Africa are produced in KwaZulu-Natal, as well as the majority of the country's vehicle exports. The activities of the DAC are managed by an executive committee. The executive committee is responsible for determining the strategic direction and overseeing the finances of the public-private partnership, while the core focus areas or programmes and identified interventions are directed by Technical Steering Committees (TSCs) of industry representatives that meet on a regular basis. The DAC Section 21 Company operates according to a fixed business plan which aligns all activities with a set of goals common to the parties in the public-private partnership. The overarching long-term strategic objective for the KwaZulu-Natal regional automotive industry is to double its size by 2020. This is consistent with the national government's objective of 1.2 million vehicles being produced in South Africa by 2020. The DAC partnership is focused on supporting the local automotive industry to achieve this strategic objective. The low levels of local content in the automotive value chain undermine sustainable competitiveness of the sector principally through the exposure to cost-raising factors such as exchange rate volatility, duties and tariffs, and logistical costs. In order to address local content and cost competitiveness, the DAC analyses automotive industries in countries that have successfully increased local content, examines opportunities for firms to capitalise on the Automotive Production Development Programme (APDP), and increases dialogue between local automotive manufacturers. Attracting, developing and retaining certain skill sets are central to the automotive sector. Areas that are being examined include the identification of key skill sets and the skill supply requirements needed through to 2020. The DAC further addresses the skills development challenge by ensuring that member firms acquire the appropriate internal human resource development capability. Through the DAC's public-private partnerships, the extensive public and private sector resources are supported and supplemented to benefit local automotive firms. Provision and availability of appropriate infrastructure and infrastructure-related services is an important investment and growth determinant. Cost and reliability can be identified as two requisite outcomes of this particular focus area. In the short term, the DAC is engaging with opportunities to support optimisation of value chain efficiencies within current operational constraints. This support is principally operational in nature with a view to reducing cost and improving reliability given current environmental constraints. Additional priority focus areas that influence infrastructural cost and reliability will be examined in the long term. strategies is central to success of this area, this needs to be supplemented by sound cluster-based initiatives aimed at optimising resources invested in this area. As an effective economic transformation and empowerment facilitator for the automotive industry in KZN, this programme has delivered significant benefits to the industry. 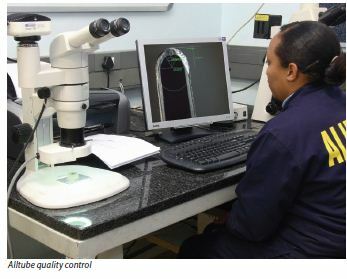 The DAC has identified the areas of market access and investment support as being central to facilitating growth opportunities for the KwaZulu-Natal automotive industry. These strategic issues will be handled under the auspices of growth. The DAC assists member firms to achieve World Class Manufacturing status through various initiatives and through the KZN Chapter of the South African Automotive Benchmarking Club.